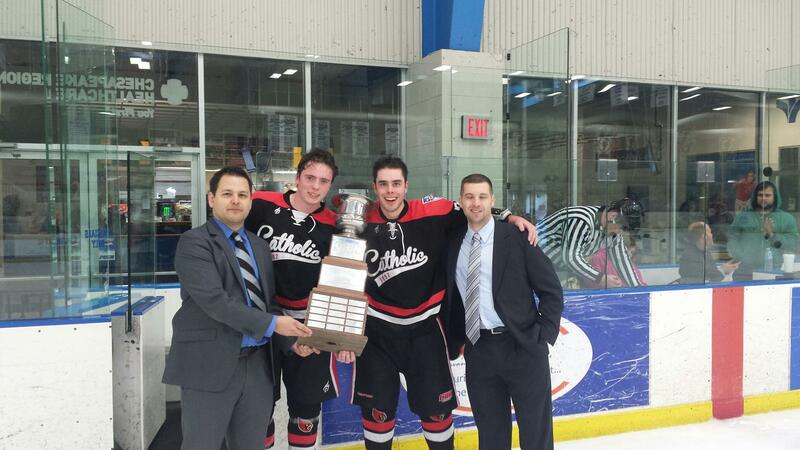 This past February, CUA’s Frozen Cardinals won the Blue Ridge Hockey Conference championship cup in the American Collegiate Hockey Association (ACHA) on a 13 game wining streak. They defeated their archrival UMD Terps 5-4 in the final playoff game. What started as club hockey around the USA a number of years ago due to the reluctance of the NCAA hockey to expand beyond the northern states, the ACHA has grown from 15 schools in 1991 into a highly organized league of 382 men’s and 36 women’s teams in 3 divisions throughout the country. (ACHA.org) In fact, the term “club” is consider a four-letter word in the ACHA and the league is recognized by the National Hockey League. In there first 2 exhibition games September 25 and 26, the Cards lost both to the George Washington Colonials in the home and home series – being heavily outscored by GW. One could chalk it up to their regular goaltender being away for a while and the lack of an experienced back-up keeper, but the Colonials are also in a higher division. However, the Cards beat them last season. Hopefully a back-up goaltender can be recruited soon. If you are interested in trying out for the Frozen Cardinals contact Coach Nick Williamson (cuacoach@brhockey.com) or this Faculty Rep (hostovsky@cua.edu). Next → Next post: Hurricane Joaquin Won’t Stop Capital Fest 2015!